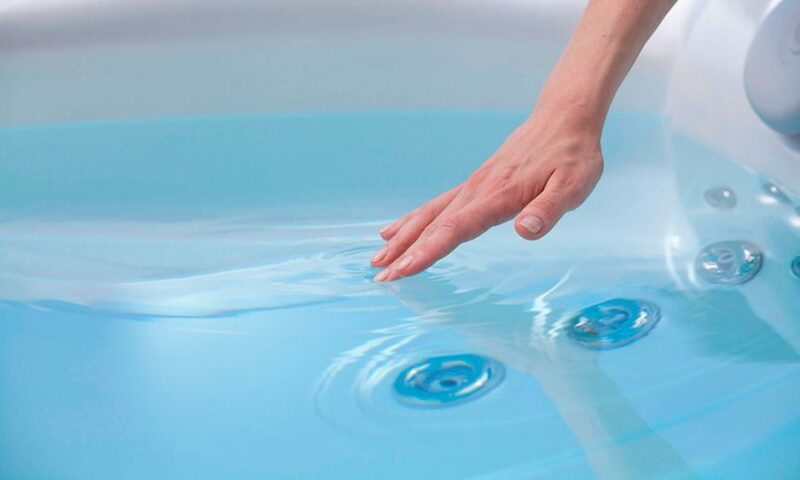 Through the following steps, our hot tub and home spa care guide explains in easy terms what is required from day 1 of either installation or a water change. This refers to the measure of alkaline salts affecting the balance of the water. This also affects the hardness of the water so its important to measure water balance accurately to avoid scaling. This creates a buffer against any sudden changes in the PH. This can be reduced by using PH Reducer (dry acid) dissolved in warm water prior to switching the tub on at the mains, but after the tub is filled with water, then lowering slowly into the filled hot tub and gently emptying the contents into the lowest point possible and removing the jug from the water. Leave this process to work for 2-3 hours and then turn your hot tub on. If you need to increase alkalinity at any stage this can be done by purchasing a increaser from one of our shops. When this process is complete you are ready to then test your tub and move to the next stage. This is the term to indicate whether the water is acidic or alkaline. This can be altered by using the PH Increaser or PH Reducer. Using your test sticks adjust to 7.2-7.4ppm then move on to the next stage. At this stage you are ready to sanitise your hot tub. This is a disinfectant chemical to kill bacteria and keep it safe for bathing in. Using your chosen sanitiser, dose your tub to the following readings. Chlorine 3-4 ppm or Bromine 3 ppm. A low reading means the chlorine in your tub will dissipate when exposed to sunlight. The most common way to decrease a high reading is to drain or partially drain (by approx 18 inches) and top up with fresh water. Check sanitiser level and dose as required, keep an eye on other levels for any sudden change. If any scum marks appear around the waterline clean away with cleaning spray and a non abrasive/non shedding cloth. Shock spa with non chlorine or chlorine shock granules dependant on chlorine or bromine set up. This should be diluted in warm water then added to spa and follow instructions on the label. Add spa clarifier and an anti foaming agent to enhance clarity and control any foaming compounds. If you are in a high calcium hardness area, add a dose of de-scaling liquid. Clean filter cartridge using a cartridge cleaner. When ready to empty and refill your hot tub, purchase one of our bottles of hot tub flush to put into your spa water prior to emptying and follow the instructions on the bottle. This will help flush out and clean the jets and pipework within your tub to avoid any build up where it can’t be seen. Then refill with fresh water. You will require a service on your hot tub every 12 months, this conforms to your warranty on your tub. It is also a good time to replace your filters at the same time. Please give us a call on 01225 781 444 to arrange an engineer to service your hot tub. We are here to help 7 days a week if you have any questions. Welcome to the premium tubs family! Subscribe and be the first to get our latest news and exclusive offers.